I am calling this the official start to my travel blog! Sure, I had it going over a month ago, but at that point I was still just testing things out, now I'm committed. Speaking of commitment, today also marks two weeks until my departure date of July 3. 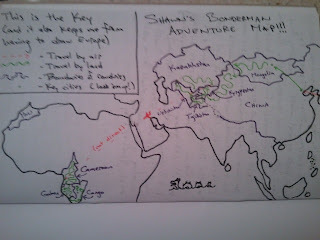 As I mentioned before, the past couple of months have been a lot of figuring out details and trying to set up homestays and things to do, and lay out a general travel outline. I've also realized that there is NO WAY I'm going to have it all planned before I go, so I'll definitely be doing a bit of the "ok, now what?" type of travel as well. What I do know now is that once I land in Beijing on the 4th I'll be staying with a couchsurfer for a couple of days while I try to figure out how to get up to Mongolia. I'm opting for the cheaper, slower and less direct route north (instead of the $300+ trans-mongolian railway), but apparently it's also a hard route to find for foreigners. Good thing I'm fluent in Mandarin. I figure as long as I learn "train" "mongolia" and "no problem", I should be fine, right? Another update on the itinerary (although all plans are still written in jell-o): I've added Morocco to the list. I need to get a Cameroonian visa before I get there, and it turns out there is no Cameroonian embassy in Kazakhstan. Weird. Turns out, there are relatively few Cameroonian embassies in the world. I almost was stuck going to Paris (lame) to find one, but then I found that there is an embassy in Morocco, flights are cheap-ish to Morocco, I don't need a visa for Morocco, and I know a Peace Corps Volunteer in Morocco, so that's been added in as a transition country between Asia and Central Africa around New Years'. 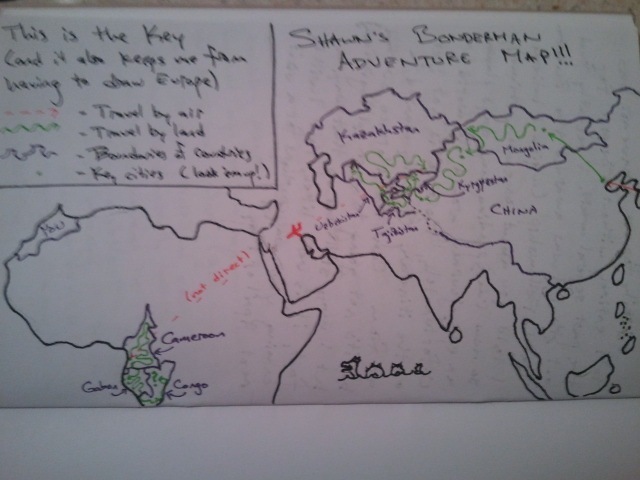 Here is the slightly modified map that I drew which sort of includes Morocco. Just imagine that the little plane goes all the way to Morocco, THEN to Cameroon. I swear the seamonster's there. 1) Do you know anyone in these countries that you can set me up with? I'd love some places to crash or things to do. 2) Have you ever been to any of these countries and know of some must-see/do things?